What makes it possible for you in the real world, and why SHOULD it matter to you? 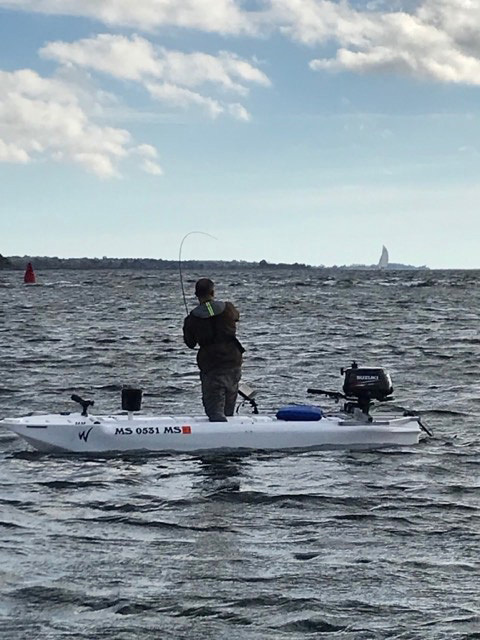 This article examines what makes stand up fishing so important, and why an increasing number of kayak fishermen are disappointed by kayak designs that fail to deliver adequate stability, comfort and safety. 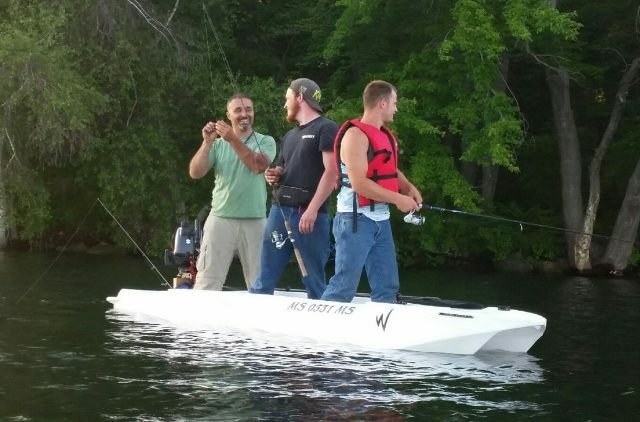 These anglers end up standing and fishing in a Wavewalk® 500 Kayak, often despite potentially problematic factors such as their body size, old age, and even certain disabilities. The above video shows that the stability offered by the W700 is comparable to the stability offered by boats such as Jon-boats and dinghies, namely that although the W700 paddles better than any fishing kayak or canoe out there, it is no longer a kayak when stability is concerned – It is a boat. This is why this article about kayak fishing standing is mainly about the super-stable Wavewalk® 500 kayaks in comparison to other fishing kayaks out there. What about stand up fishing from sit-on-top (SOT) kayaks? Why is standing in your fishing kayak important? Are other kayaks safe enough for stand up fishing and paddling? What about very wide SOT kayaks? What happens when you catch a fish standing up in a kayak? People all around the world have been fishing from small boats for millennia. Interestingly, many native fishermen like to stand up in their boats when they propel them and fish from them. After all, what could be more natural? If possible, standing is both a powerful and comfortable position for a person making a continuous physical effort. It is good for our blood circulation, less strenuous on our back and it enables us to make a good use of our legs, which happen to have the most powerful set of muscles in our body. It is worth noting that wade fishermen, people who fish from shore and people who fish from bigger boats also like to fish standing, if not all the time at least for a great part of the time. Standing makes is easy to cast a line or throw a net, and certainly makes it easier to scout for fish and better stops to fish in. When the native people of the arctic circle developed their kayaks the L position was natural to them and they were not particularly concerned with comfort but rather with stealth, as their kayaks were designed mainly as hunting boats enabling the hunter to get close to its prey without getting noticed. However, when these people went fishing or whaling they usually preferred to use Umiaks – a type of big, wide and stable multi-passenger seaworthy canoe that offered them the possibility to stand up. 2. What about stand up fishing from sit-on-top (SOT) kayaks? Stand up kayak fishing sounds like an oxymoron since most people find it difficult enough to sit it inside or on top of a kayak, especially when it involves fishing. The reality with regards to traditional SIK and more recent SOT kayaks is that these small and lightweight crafts offer good mobility at a low price and for a low cost of maintenance, but at a price of diminished comfort and the inability to do anything standing up. 3. Why is standing in your fishing kayak important? Besides the fact that standing up improves your chances of catching fish there’s a more important fact related to it: Your ability to stand up goes directly to your comfort and well being, and to your overall fishing experience. After all, catching fish is fun but not as much when it comes at a price of unnecessary fatigue, serious physical discomfort and even pain resulting from being limited to a single, uncomfortable sitting position, without being able to do anything to change positions and relieve pressure on your lower back. When fishing comfort is key to both success and fun, and neither leg numbness nor back pain may contribute to either although you’re most likely to experience at least one of them after sitting for a while in the traditional kayaking position. And don’t let yourself develop hopes in ‘improved kayak seats’…- Adding some cushioning and changing the shape of the seat can’t change the basic physiological facts: You’re stuck in a sitting position to which you’re not used, and your legs are pushing you backwards and creating a pressure point in your lower back. Even today, most fishing boats are big and stable enough to enable their passengers to stand up while fishing. 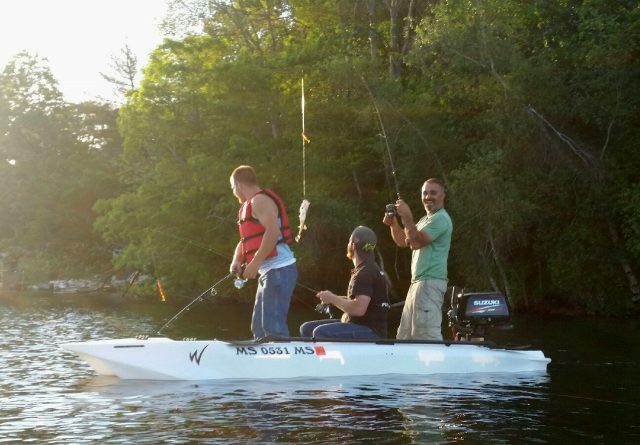 So why shouldn’t you stand up in your small, inexpensive and portable fishing kayak? The patented Wavewalk® 500 twinhull Fishing Kayak offers you to do that, as well as many other things without giving up any of the regular fishing kayak advantages. In fact, when it comes to the known advantages of fishing kayaks over bigger fishing boats the Wavewalk® 500 Kayak offers you some real, additional advantages such as better protection against wind, spray and waves, better mobility when it comes to ease of launching and take-out, better handling of the surf, better tracking, more dry storage space, and overall a much higher level of seaworthiness. Kayak fishing may be a sport, but since you’re doing it for fun you may as well have fun doing it. Kayak fishing is a good idea if indeed it’s done properly, that is without reducing your fishing experience. 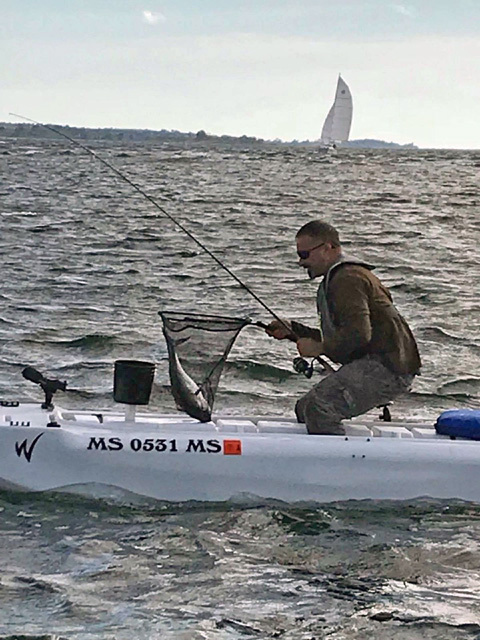 The W Kayak can unleash the full potential of kayak fishing and upgrade it to what it’s really meant to be: a challenging, full sport activity that you can practice without constantly thinking of the comfort that bigger fishing boats have to offer. The Wavewalk™ kayak is the only kayak that was developed for high performance stand up paddling and stand up fishing in moving water, and it’s the only kayak that fits both these extreme applications in terms of safety and comfort. We call this unrivaled performance of the Wavewalk® 500 kayak “Super Stability”. BTW, the new Wavewalk® 700 is more stable than the W500, and the stability is offers is comparable to the stability that one experiences in a Jon boat. We call it ‘Boat Stability’. 5. Are other kayaks safe enough for stand up fishing and paddling? Since many things can and will cause you to lose balance if you choose to stand up in or on top of a kayak, you must be able to react effectively and regain balance even in adverse conditions, and our W-kayak enables you that while no other kayak does. Our patented twinhull Wavewalk® kayak is the only kayak that offers each of your legs to stand in a hull of its own, and it is the only kayak created especially for stand up paddling and stand up fishing. Sooner or later you will lose balance (stuff happens – you can be sure about that! ), and for such cases you need to have a ‘Plan B’, which would be to fall down on something that’s high enough to stop your fall as well as support you. You don’t want to fall all the way down on your kayak’s deck since it will cause you to fall overboard. You definitely don’t want to slip either, and therefore your feet must be secure where you stand. Our Wavewalk® 500 twinhull kayak is the only kayak featuring a 14″ high saddle that you can fall down on at will, swiftly, and when you choose. The W-saddle has a hull on each side, and you ride it with each of your legs supported by its own hull, and your feet planted at the bottom, several inches below waterline. Being positioned that low is what makes your feet really effective for stabilization and control. For these reasons you’ll never be truly confident or comfortable standing on top of any sit-on-top (SOT) kayak, even if staged pictures and movies may show you people standing on their SOT kayaks and fishing. You must remember that neither sit-in nor SOT kayaks were invented for stand up paddling or fishing in the first place. Some people are capable of pedaling a unicycle while juggling oranges, and others can hop between wooden logs floating on a river. Does it mean you can do it? Would you even like to try? -What’s the point in taking the risk of falling overboard anytime you go fishing? -Would you feel confident standing up on an unstable platform? 6. What about very wide SOT kayaks? SOT kayaks with very wide hulls track poorly and are hard to paddle, and they may be stabler than narrow ones, but definitely not stable enough when it comes to paddling and fishing in confidence. This is because most of a SOT kayak’s buoyancy (that’s what actually supports your weight) is distributed along its hull’s center line, where it is useless for effective stabilization. If you want a kayak that’s stable you need to design it with all its buoyancy on its sides – exactly as it is in the Wavewalk® 500 twinhull kayak. In fact, the W-kayak has no buoyancy wasted along its center line since 100% of its buoyancy is located on its two sides – as far as possible from the center line. The use of outriggers, whether as add-ons or integrated into the hull can improve your kayak’s stability, but not enough for stand up paddling and fishing in full confidence, which is what you really need. 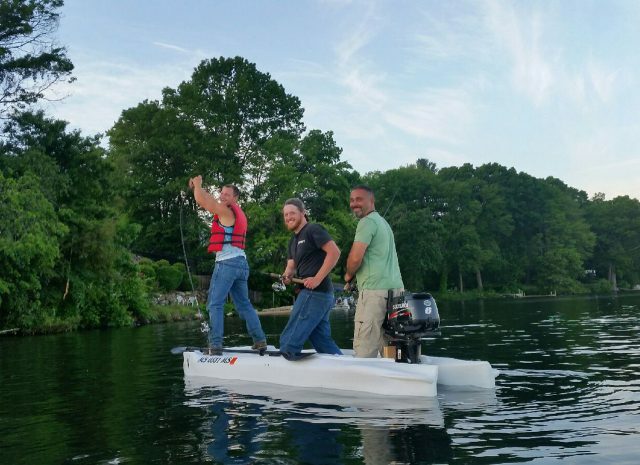 This is because kayak outriggers are located in the back part of your kayak’s hull, and therefore may support extra weight and pressure only if you apply them towards the back. Such outriggers are nothing more than a gimmick if you’re applying your weight forward and sideways, and you can be certain that when you’re standing up you’ll have to do that often. Remember: stuff happens in real life, and water is always wet, and sometimes it can be cold, and deep. Between attached and integrated outriggers the latter offer reduced stability because of the fact that their center of buoyancy isn’t located as far away from the kayak’s center line, where it would offer more support. It’s simply a bad idea when stability is concerned, and traditional outriggers offer a better support. Furthermore, integrated outriggers coming out of the main hull form a Y shaped hull which is probably the most ineffective form ever created when it comes to paddling, or any other form of propulsion. In other words don’t count on such design for paddling. Both need to be extremely stable, but there are differences in requirements. A stand up paddling kayak is required to be narrow as possible, since it makes it easier to move the paddle efficiently and ergonomically, as it is in regular (seated) paddling. A kayak that’s too wide would under perform in stand up paddling, as it would in seated paddling. A stand up fishing kayak needs to be even more stable than a stand up paddling one because the paddle may help you balance yourself, while a fishing rod would be ineffective for this purpose. This is where the location of the kayak’s buoyancy becomes critical, as does the location of your legs and feet. The Wavewalk® 500 is only 29″ wide, and yet, due to its revolutionary design that was granted a US utility patent, it is the stablest fishing kayak out there. This means that once you’ve learned to properly operate the W-kayak, you’ll benefit from its unique features, while other kayaks simply don’t have such a broad performance envelope to begin with, and would never offer you anything that even comes close. Again, we recommend the you watch our demo movies for a start, and judge for yourself. 9. What happens when you catch a fish standing up in a kayak? After casting for some time you’ll probably hook up a fish. If that fish doesn’t manage to make you lose your balance and fall overboard you’d need to land it in or on top of your kayak… and then what? If getting up from the seated position and going back down to it is hard to begin with, how does it feel when you have sit down while holding a fishing rod in one hand or both hands, and there’s a good size fish dangling at the end of your line? If you’re interested in learning more about kayak design for better stability, we recommend the following article ». Never judge a kayak by stand up pictures or movies shot under regular conditions – It may look nice and cool but it’s meaningless for you since it doesn’t show performance in ‘what if’ conditions. Many things can and will destabilize you, including fish, wind, eddies, waves, wind and your own, inevitable moments of inattention. What you need to be able to judge is the ‘what if’ performance, and our demo movies will prove to you that no other kayak compares to our Wavewalk® 500 twinhull kayak. 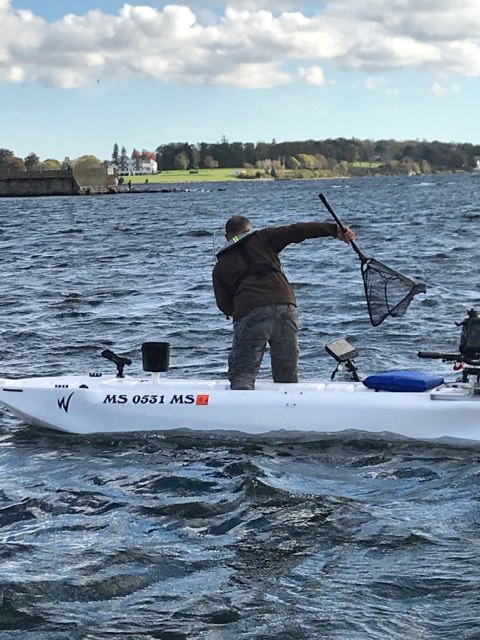 This article would be incomplete without providing more information about what people who fish standing in their Wavewalk® 500 kayak have to say about their real-life experience with it. Our website offers over 200 Wavewalk Fishing Kayak reviews contributed by such people, including full name and state, and in most cases pictures too. Electric trolling motors vs. gas outboard motors, transom mounts vs side mounts, offshore and inland – and more. Pictures of young, lightweight and athletic fishermen standing in their kayak look nice, but they don’t necessarily mean that you can do it too, and feel confident and safe while you fish.